The happy jingle of the neighborhood ice cream truck turns into hell s bells as Gregory Tudor (Clint Howard) delivers torture, murder and mayhem with every scoop of rocky road. 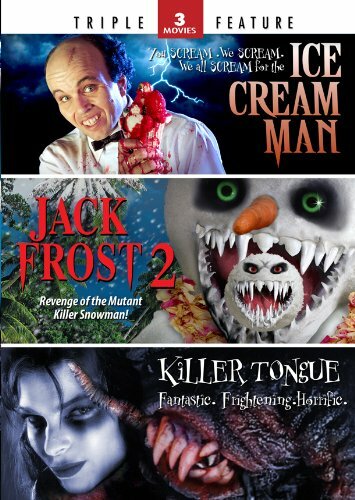 After witnessing the murder of his friend The Ice Cream King, Gregory grows up to become a demented ice cream man with mysterious frozen treats. No one is safe from the ice cream man in this pulse-pounding nightmare that s sure to leave you chilled to the bone. The incredible story begins in the New Mexico desert at the border of paranormal reality. An unlikely convergence of strange phenomenon spawns a creature with seductive feminine charms and gross mutations. With a parasitic alien inhabiting her monstrous body, Candy, the human host fights a losing battle with the beast until its secret grip can be broken. This shocking movie breaks all the rules of filmmaking and will stay with you forever... unless you can't stay with IT!